More news from Jeroen Minnema at Ocean Independence as he tells me of a €200,000 cut in the price of Falcon's 26m megayacht Baron B. A joint central with Jeroen's brother at Fraser Yachts, the megayacht was delivered in 2000 and, having proved to be a popular charter yacht, she was refitted and upgraded in 2008/2009. 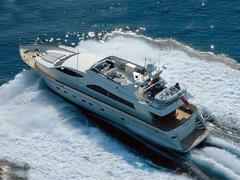 MCA compliant, she sleeps nine guests in a master, VIP and two twins and cruises at 23 knots. Now asking €1.25 million she is, according to Jeroen, "The best priced Falcon 26 on the market."